Area of Fall means the area around the spot where the bird lands, which is the center of the area of fall. The dog is allowed a reasonable radius of the fall in which to hunt out the bird. 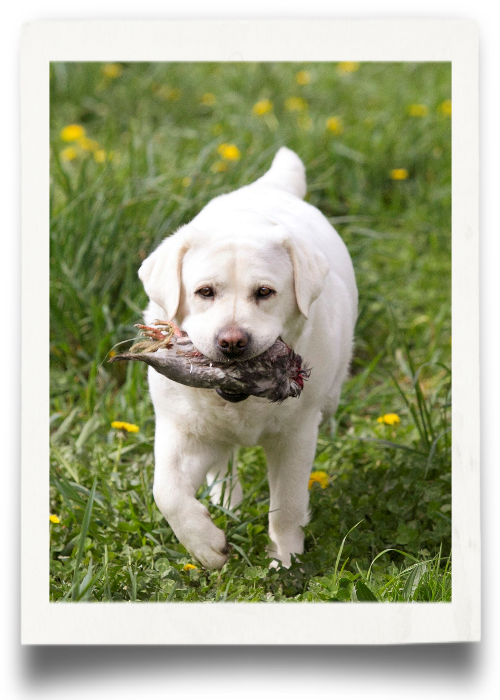 Blind Retrieve means a bird that has been planted while the dog is out of sight (the dog must retrieve the bird by following whistle, arm or voice signals from his handler). Breaking means a dog that leaves to retrieve a mark or blind before the handler has been told to “send him” by the judges. Bye Dog means a dog that is not entered in the test or an out of contention dog that will pick up marks to allow the last honoring dog to be tested. 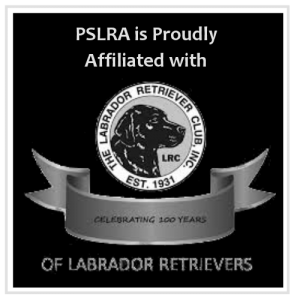 Call Back means dogs that have successfully completed the test to the satisfaction of the judges are called back to continue the testing (dogs that have failed any part of the testing are not called back to continue running). Cast means when the dog has been given a hand signal to go over or back. Controlled Break means what happens when a dog breaks but is quickly stopped by the handler and then sent by the handler to retrieve after being told to do so by the judge. Deliver to Hand means the dog shall deliver the bird to the handler, give it up willingly without dropping it and should stand or sit close to his handler at the line determined by the judge. Downwind means when the wind is blowing from behind the dog so that the dog cannot acquire the scent of the bird. Draw means the random selection of the running order of the entrants. Freeze means a dog holding a bird tightly in his mouth and refusing to release it to the handler; or locking onto a mark or thrower and not turning to see the fall or another mark. Gallery means anyone watching the test including owners, handlers and spectators (Gallery etiquette includes being quiet while a dog is on line and working and not being distractive when a handler is trying to handle the dog on a blind/mark). Handler means the person handling the dog in the test. Holding Blind means a location, from which the dogs cannot see the test (any marks or blind retrieves), where the dogs are held prior to running the test. Honor means a test of steadiness in which a dog observes another dog’s work without intimidation or interference by the handler. Line means the area designated by the judges from where the dogs will run the test. Mark means a bird that is thrown so that the dog can see it in the air and where it lands. Marshal means the person who helps the judges in setting-up the test and is in charge of communications between the judges and handlers. No-Bird means a bird that has landed in the wrong place or one that was not thrown high enough to be clearly visible to the dog. On a mark, either judge can call a no-bird and the handler must control his dog and remove him from the line. The handler will be given the opportunity to immediately re-run the dog or wait a few dogs before re-running the dog. Popping means when the dog stops and looks back at the handler for instruction on either a mark or a blind without being told to do so by the handler. Switching means when the dog starts out to retrieve one bird, reaches the area of the fall, hunts for the bird, then, not being able to find the bird, leaves the area of the fall and goes to the area of the fall for another mark. 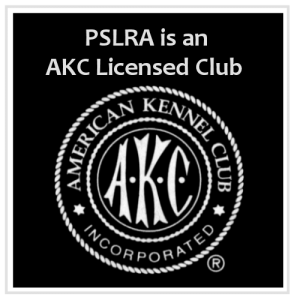 Test Dog means a dog that is not entered in the test or an out of contention dog that is run prior to the test, and that if possible, should not be overqualified. The test dog gives handlers a view of the test prior to running their dogs. It also gives judges the opportunity to make any last-minute adjustments to the test, if necessary. Under Judgment means a dog is under judgment from the time the handler says he is ready until the bird has been delivered to the handler and returned to the judges. In the WCI and WCX tests the dog is under judgment as soon as he leaves the holding blind to come to line. Judging is continuous until the dog leaves the line (a handler should not touch his dog at any time while it is under judgment in either WCI or WCX). Upwind means the dog is facing into the wind so that the dog can acquire the scent of the bird.